Board member Shad Johnson and Marky Kay Evans observe Harrison Teacher Cassie Norden teaching a Lindamood-Bell intervention session, while Williams, California board member George Simmons observes. During the past two weeks many Cañon City High School staff have fully exemplified our first core belief, we meet the social-emotional needs of all students, putting Maslow’s Hierarchy of Needs before Bloom’s Taxonomy. This was done in response to the social-emotional screening process we recently conducted, which indicated to us what we already suspected, that we have a number of students in need of significant social-emotional intervention. The follow-up to the screening process was a bit confusing. However, our teachers, counselors, and administrators approached each student concern with the appropriate concern, and I’m certain our actions have literally offered a lifeline to some students who were truly struggling. I just can’t thank you all enough for what you do for our kids on this front! I’d also like to offer some kudos to the Harrison School 7th grade team of Amelia Harrell, Phil Pugin, Billy Staples, and Danielle Woiteshek. I’m told they have worked very hard to develop a cohesive and supportive grade level culture that both meets the needs of students, and of each adult. They have developed team norms that each follows both in and out of the classroom. Principal Marne Autobee says, “this is a very powerful tool when working with any challenging student, as they have the support of each other to lean on while giving every student a clear message.” Harrison TOSA Sheryl Wiseman adds, “their culture prohibits students playing teachers against each other, as they all adhere to the same systems, routines, and expectations, from food to homework, both in the classrooms and pods.” Some examples of the good work the team is doing includes being extremely proactive in working toward Kids at Hope core beliefs, meeting with a small group of students once a week to work through, Stephen Covey's The 7 Habits of Highly Effective Teens, and developing effective behavior and academic plans for many At Hope students. Great job! Finally, I wish to offer my appreciation to our literacy team and the many literacy interventionists who were willing to be observed when the Williams, California School District stopped by to observe our Lindamood-Bell implementation last Monday. It was an exhausting afternoon, but I was extremely proud to watch our staff sharing the great work we’re doing with our implementation. Why might we bother putting forth so much effort to share our experiences with another school district? Assistant Superintendent of Schools Adam Hartman said afterward that one of our literacy coaches expressed to him how useful it was to step back and take stock of all she has been doing. The experience, no doubt, helped to solidify the knowledge she has gained. Now that’s a willingness to take positive risks! As part of our future focus, our Board of Education plans to hold a Board Candidate Development Academy. The Board invites student-focused community members interested in serving on the board of education to participate in a Board Candidate Development Academy. As a reminder, our next board election takes place in November 2019, and three seats will be available at that time. Academy participants will have the opportunity to engage with current Cañon City School Board directors to learn about best practices in school district governance, recent significant board actions, the Board's view of the current state of the district, how education finance works, and long-term instructional program improvement efforts. Participants will also have the opportunity to learn the ins and outs of running in a board election. The Academy is scheduled to take place in mid-November. Those interested are asked to contact Board/Superintendent Secretary Colleen Carroll before November first, by email at colleen.carrol@canoncityschools.org or by phone at 719-276-5700. Architects from RTA present on how our Core Beliefs can guide construction at Cañon City Middle School. I want to offer a gigantic thank you to Director of Finance Buddy Lambrecht for all the hard work he has been doing to clear the Washington Elementary property title prior to the upcoming State of Colorado COP sale. Our final hurdle is requires addressing a lean on the property related to solar panels located there. This has not been an easy task, but we are beginning to see a light at the end of the tunnel. Our CCMS Design meeting was simply amazing on Tuesday afternoon. During the session, our architects pointed out how our adopted Core Beliefs create a healthy conflict between a feeling of safety (we put Maslow before Bloom) and encouraging positive risk (learning growth matters most, requires risk-taking, and the work we do in our schools has the greatest impact on this). They used this philosophy to share with us a concept that might lead us to design the building from a standpoint of safety/protection from the outside, but with long sight lines and transparency to our protected courtyard on the inside. I think everyone in the room was very impressed and looks forward to heading down this design path as far as what the building will look like from the outside. District staff prepare for a reunification drill at the Holy Cross Abbey last Friday. Last Monday we had a visit to our Lindamood-Bell intervention process from Williams School District in California. On Tuesday we have a BSERT meeting in preparation for a Friday reunifications drill, a Superintendent Advisory Council meeting, and a CCMS design team meeting. On Wednesday I worked on our Management's Discussion and Analysis document related to our audit, and then began work on recommended adjustments to our Federal Programs Grant. On Thursday I had a series of meetings and some routine office work to complete. On Friday, we held a district-wide reunification drill. I also participated in a screening process for the Colorado Association of School Executives Superintendent of the Year award. Though we have no school this Monday, the Washington Elementary Design Team will conduct school visits related to our construction projects. Our goal is to revisit some innovative schools we saw last summer, but while students are occupying them. I plan to return to Cañon in time for the board work session and meeting that begins at 4 PM. On Tuesday I have an expulsion hearing, a McKinley Turnaround support team meeting, and an Instructional Leader PLC session. On Wednesday we have a McKinley staff meeting to kick off their Turnaround plan implementation, and an several hours-long Construction Projects Meeting with architects, builders, and key administrators. We’ll end the day Wednesday with a Washington Design Team meeting. On Thursday I'll be in Denver for CASE Superintendent of the Year finalist interviews, and on Friday we'll participate in a fabulous Dream Big event hosted at Florence High School. This was made possible thanks to the Fremont County Economic Corporation. It is my understanding we have more than 170 CCHS kids set to attend. Last week I shared the third in a series of posts aimed at answering the Who, What, Why, and How of Amendment 73. I'm doing this because through a resolution in support of Amendment 73 our Board of Education has directed me to distribute a factual summary about the measure to staff and community. This final installment is aimed at answering the question "what impact would the passage of Amendment 73 have on Cañon City children?" 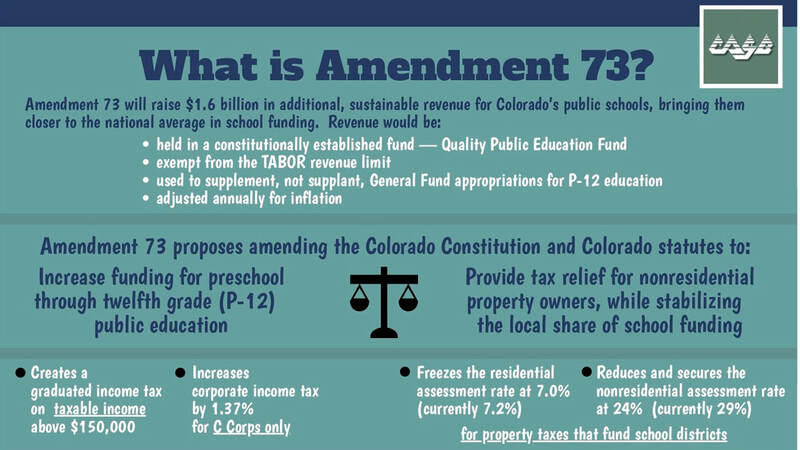 If Amendment 73 passes, as soon as next school year the Cañon City School District would receive approximately $6 million more in operating revenues each year moving forward. Through its resolution of support, the Cañon City School Board has pledged to invest these new dollars in specific areas. Having worked with this governance team on our recent mill levy override, we can believe when they say this is where they are going to spend the funds. • 33% of new dollars will be invested to increase compensation and benefits for all employees. This will be done in an effort to continue attracting and retaining the highest quality people available to work with our children. This commitment is steeped in the belief the best thing we can do for children is to ensure we continue to bring wonderful people into their lives. Whether it's the safe and friendly bus driver who greets them first thing in the morning, the hardworking nutrition services employee who prepares their healthy breakfast and lunch each day, the classroom teachers and paraprofessionals who support their social-emotional needs and spark their interest in learning, the health tech, library tech, counselor, secretary, or education specialist who makes sure they are ready to learn, or the custodial and operations staff who clean and repair the building where their daily instruction takes place. Effective schools need effective people to operate and, unfortunately, a result of Colorado's underfunding of its education system has driven pay rates lower and lower. Thus, it is becoming more and more difficult to fill our open positions with people our parents and community would be comfortable placing their children in the care of. • 25% of new dollars will be invested to increase the number of highly qualified staff we employ. This will be committed to areas such as classroom instruction to decrease student to teacher ratios, provision of special education services, classroom instructional support, counseling services, technology support, instructional coaching, health services, and maintenance and upkeep of facilities. The primary goal here will be to lower the student to teacher ratio and to offer more comprehensive support services to our most challenged students. • 25% of new dollars will be allocated to general and capital reserve funds. We know this is not a glamorous plan. However, doing so will create healthy fund balances to allow the district to address future personnel needs, facility improvement projects, and to provide grant matches to more effectively leverage local dollars. The Great Recession created a $3.5 million annual budget shortfall in the district that continues to this day, resulting in the need to defer building maintenance and deplete once strong reserves in an effort to simply keep instruction going. • 6% of new dollars will be invested in safety and security upgrades. This will include upgrading outdated video surveillance systems, purchasing technology-based security platforms, placing well-trained security guards in every school, and expanding our team of School Resource Officers. • 4% of new dollars will be invested in continuous technology upgrades. This will include state of the art equipment that supports 21st-century instruction, and broadband service upgrades to support our newly purchased one-to-one devices. During Great Recession caused budget cuts, Cañon City Schools fell more than a decade behind its renewal schedule for fundamental curriculum materials in subjects such as reading and math. It hasn't even been an option to significantly update science, social studies, and life skills course materials. These additional funds would make it possible for Cañon City Schools to upgrade to more accurate, relevant, and engaging curriculum materials in all subjects on an every 5-year cycle. • 2% of new dollars will be applied to eliminating all fees currently required of students and parents for participating in regular education programs and extracurricular activities. No longer will our parents have to pay $75 for their child to participate in a sport. The $25 annual fee for a student to be assigned a technology device will go away. Art and Vocational Education fees will be eliminated, as well as others. The district also pledges to eliminate fees currently charged to local non-profit organizations and agencies, such as the Canñon City Recreation District, allowing them to pass cost savings on to their program participants. Since we implemented the free for every student K-8 lunch program we have had dozens of parents asking why we don't also do this for 9th through 12th graders. If Amendment 73 passes, we'll be able to. Ballots have already been mailed to registered voters. They are due back to the county clerk's office by end of day November 6th. Whatever your position on this ballot issue, or all the other voting decisions you'll be faced with, I encourage each you to participate in our democratic process by casting your vote.